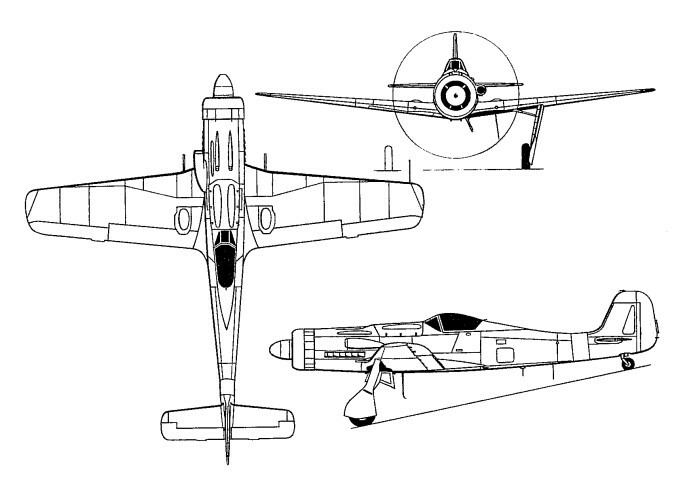 The Ta 152 was a development of the Fw 190D. Though the Ta 152 looked superficially like a Dora 9, it was actually intended to be an almost completely new design, with quite different structure and a DB 603 engine. The Ta 152A single prototype, GH+KW, first flew on 12/07/1944, but was destroyed the following day by accident. V21/U1 (then V21/U2), V6 Werk NR 110006, V7 Werk NR 110007, and V8 Werk NR 110008), were tested between November 1944 and Febuary 1945. Later much of the original 190 structure was restored, to speed production, and the 152 was built with both the DB 603 (152C) and Jumo 213 (152H) engines. The wings of the Ta 152C being similar in planform to those of the Dora-9, while those for the Ta 152H are of the high aspect ratio, long span variety. The FW 190C prototypes went on to be modified and used as prototypes for the Ta 152 H.
The Ta 152H was a high-altitude fighter, but appeared too late, and few became operational. The Ta 152s were often used to protect jet fighter bases. 215 built. The Ta 152H-0 high-altitude version had a series of prototypes: V18/U2 (GH + KB), destroyed 08/10/1944, during its first flights; V20, Werk NR 0042, (GH + KQ), with 1 Jumo 213A; V21 Werk NR 0043; V29 W NR 0054, become the V29/U1 with cabin pressurisation; V1 W NR 11001, built in June 1944; V2 W NR 11002 in July 1944; V33/U1 W NR 0058,12/07/1944; V30/U1 W NR 0055 1 Jumo 213A (GH + KT), 06/08/1944; V3, V4 and V5; V 25 W NR 110025; Fw 190 V32/U2 with engine Jumo 213E-1. Followed up with Ta 152H-0 Werk NR 15001 - 150020, 10/1944. General armament of 3 guns, some with 5. Werk NR 15004 was the first of the R/11 with an automatic pilot. Prop: three-bladed wood Junkers VS-111 fixed pitch 3,50 m dia. 2 protototypes: V 9 Werk NR 11009 and V 14 Werk NR 110014. Propeller: Junkers wooden three 3.6 m (11 ft 9.75 in) dia.